We have release the new Wisej 2.0! It’s the foundation for supporting Linux in the next major release. Responsive properties are a new concept introduced in Wisej 2. They work at design time and at runtime making Wisej even more flexible! Every property marked with the [ResponsiveProperty] attribute can hold multiple values at once (similar to [Localizable]). Each value is associated to a configurable client profile and automatically selected by Wisej when the profile matches the user’s device. At design time, you can pick the active profile in the Wisej design bar and design your containers to automatically adapt to difference client profiles. Watch the new Responsive Properties video. Wisej 2 is the only web framework in the world where the server can call the browser and the browser can call the server using async/await. * Async/Await in ASP.NET blocks the response. In Wisej it’s truly asynchronous. 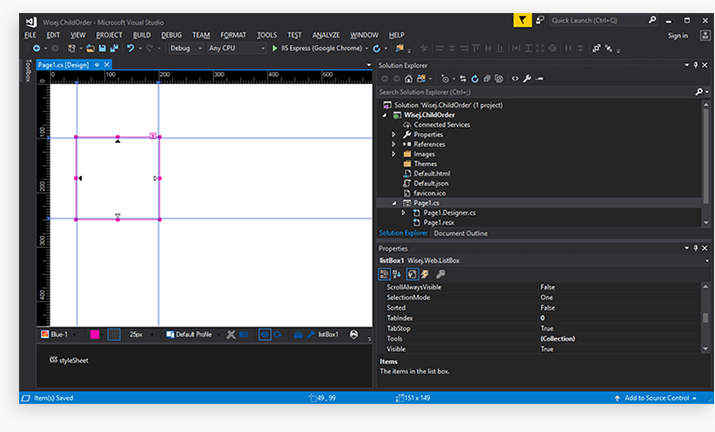 Design any individual control class in the Visual Studio designer to create custom grids, editors, buttons, and more. Double click on your control classes to open the single control in the designer and preview any change you make to your new control, be it a ComboBox or a DataGrid. You can also add components, extenders, and child controls. The designer uses modern colors for the selectors and glyphs, supports vertical and horizontal snap lines, and new anchor glyphs. Rulers snap lines are saved in design mode for each container to allow developers to set layout guidelines. Anchor glyphs show on selected controls to indicate and change which side is anchored. Wisej 2 has only 1 main assembly for the deployment and 1 for the designer. The renaming of the assemblies and consolidation of the code will help us add .NET Core and Mono/Xamarin support. We have added new templates, wizards and controls. 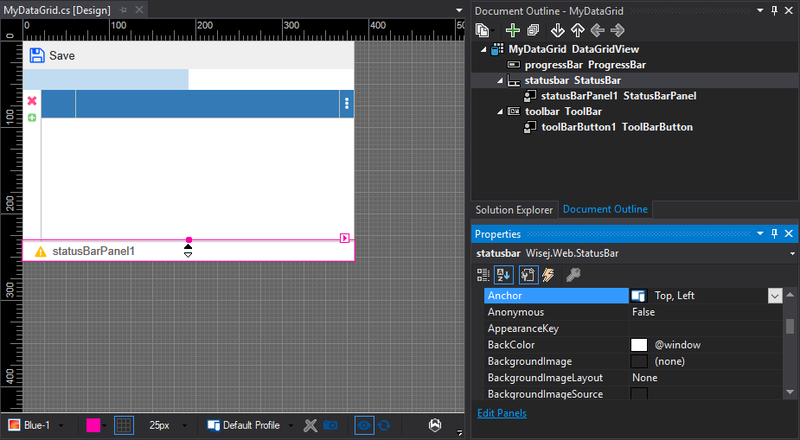 The new templates lets you change the initial loader and create new controls by extending any existing control class. New controls and extensions include the Wisej.Web.TagTextBox (added since 1.5 as a test feature), a bootstrap-styled NavigationBar control, and a cool gmail-styled retractable SideButton. Wisej 2 supports the new Brotli compression. We have added full support for the new Brotli compression also for the browsers that don’t have it built-in. Wisej 2 now supports deflate, gzip and brotli also for WebSocket communication. In our tests Brotli reduces the size of the response stream in half compared to gzip.